Info "You know what this needs? Ketchup." 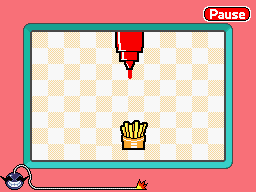 Ketchup Down is one of Ashley's microgames in WarioWare: D.I.Y. This replaces Mochitsuki, a microgame from the Japanese version where the player can make a rice cake. The point of the game is to squirt the item of food with ketchup. The plate of food rolls and varies in size, depending on the size of the food. The foods include a large omelette, a hamburger patty, and a carton of fries. When the object is under the ketchup bottle, the player needs to tap the ketchup bottle in order for it to squeeze it out. Occasionally though, the omelette sometimes stops and has an exclamation point over its head. The player needs to wait until the omelette starts rolling again to put some ketchup on it. If the player manages to put some ketchup on the item of food, the game is won. If the ketchup hits the ground or if the item rolls away, the game ends in a loss. This page was last edited on December 23, 2018, at 05:33.